In 2018 the Green Market Oracle (GMO) is reprising its annual Green School Series. Over the course of the last seven years the GMO has published almost 400 articles related to environmentally oriented academics, sustainable infrastructure and green initiatives in pedagogical settings. In the coming weeks we will post articles on a daily basis related to the green schools and sustainability focused academics. These efforts contribute to the growth of a well informed population, a sustainable economy and ultimately a healthier planet. This focus is a key part of the GMO's mission to help facilitate the convergence of sustainability and the global environment. The eighth installment of the GMO's Green School series included 19 articles. This included dozens of academic degrees, teaching climate denial in schools, renewable energy & conservation, and why business schools get a failing grade in environmental sustainability. Click here to access the 2017 edition of The GMO's Green School Series. In the seventh installment of the GMO's Green School Series there were a total of 32 articles. This comprises a review of the growing green schools movement, best practices and what sustainability professionals need to know. It also includes information on schools, degrees, accreditation, early education, ranking, tools, solutions, and awards. Click here to access the 2016 edition of The GMO's Green School Series. In the sixth installment of the GMO's Green School Series there were a total of 26 articles. This includes a review of green educational opportunities at universities and colleges, different types of related accreditation (degrees, programs, and certificates) early education, student led fossil fuel divestment initiatives, water stewardship efforts and resources, energy and infrastructure in green schools, rankings of the most sustainable colleges and universities and resource tools. .
Click here to access the 2015 edition of The GMO's Green School Series. In the fifth installment of the GMO's Green School Series there were a total of 69 articles. This includes posts covering general information, educational programs and courses, online education, sustainability initiatives, school rankings, resources, green building and campuses, retrofits, renewable energy, fossil fuel divestment, competitions and awards. 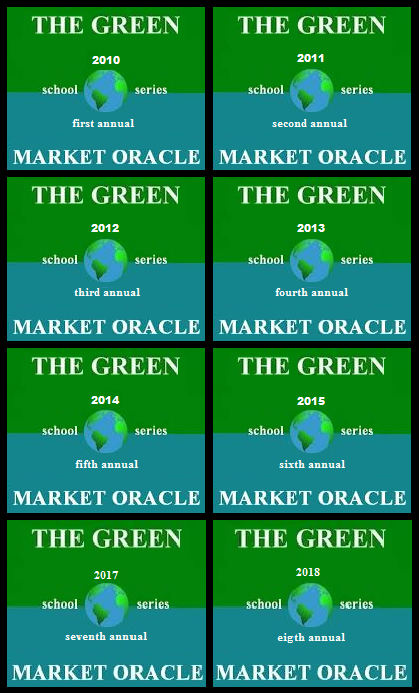 Click here to access the 2014 edition of The Green Market Oracle's Green School Series. In the fourth installment of the GMO's Green School Series there were a total of 26 articles. This includes posts on green school rankings, educational programs and courses, buildings and campuses, fossil fuel divestment, renewable energy, campus competitions and fellowships. Click here to access the 2013 edition of The GMO's Green School Series. In the third installment of the GMO's Green School Series there are a total of 65 articles. This includes posts on the value of green education, programs and courses, buildings and campuses, support programs, teaching resources, and business schools. Click here to access the 2012 edition of The GMO's Green School Series. In the second installment of the GMO's Green School Series there are a total of 70 articles. This includes posts on sustainable education, school buildings, grants, programs, awards. Click here to access the 2011 edition of The GMO's Green School Series. In the first installment of the GMO's Green School Series there are a total of 60 articles. to access posts on green student resources, the growth of green education, masters degrees, doctorate degrees, undergraduate degrees and classes, primary and secondary schools, China and Asia, buildings, and information on sustainability officers. Click here to access the 2010 edition of The GMO's Green School Series. Stay tuned for more green school information and resources this year. From now until the end of September, The GMO will feature posts as part of the 2018 edition of the Green School Series.